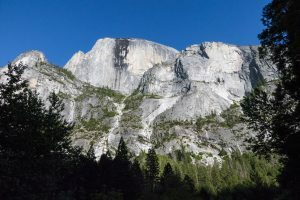 This mostly level loop up Tenaya Canyon explores it’s namesake creek, Mirror Lake, and the fantastic granite walls capped with summits such as Half Dome. Take the loop counter-clockwise to catch the sunlight shining on the granite walls throughout the hike. Walk up the paved road and take a right onto the dirt path before the bridge. The trail parallels the creek upstream through a wonderful forest. It reaches Mirror Lake, where the cascades of the creek become still ponds. As you skirt below Half Dome, views across to the granite cliffs of North Dome and Basket Dome dominate. The trail leaves the edge of the creek and passes through a mix of forest and open boulder fields before dropping down and crossing over Tenaya Creek. It travels through more forest alongside Tenaya Creek before passing the Snow Creek Trail (see Snow Creek Trail). Half Dome towers above. You reach a small bridge and sign that lets you know when you’ve arrived at Mirror Lake, this time on its western edge. Keep left where the wide trail follows the water to interpretive signs and shoreline access. Follow the paved road down Tenaya Creek once again, and cross the stone bridge to complete the loop. 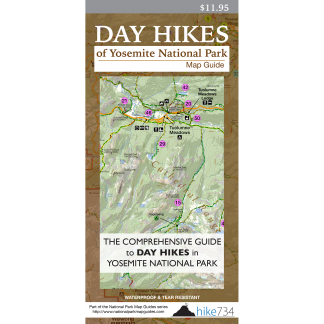 Trailhead: As there is no parking at the trailhead, take the free bus shuttle to the Mirror Lake stop #17, or the 1.7mi/2.7km walk from Yosemite Village.